Wikka Documentation: What is WikkaWiki? 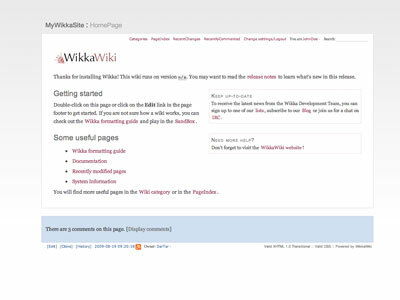 WikkaWiki is a lightweight wiki engine written in PHP, which uses MySQL to store pages. Standards compliant - Wikka is based on the latest W3C standards, RFCs as well as some others. Designed for speed, extensibility, and security. Easily adaptable to a number of different uses. Chosen by hundreds of users, projects and organizations to power their websites. Released under the GPL license.